Postcard US-3939822 to Lithuania shows a herd of bison. The fuzzy, horned giant becomes a national symbol after President Obama signed the National Bison Legacy Act into law early today making it the national mammal of the United States. 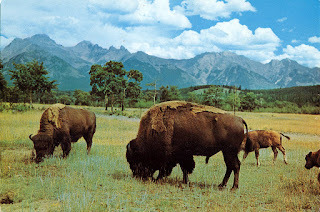 The bison nearly went extinction during the westward expansion of the United States in the early 1800s, resulting from a deliberate policy of depriving Native Americans of a significant source of food, clothing and shelter. Its population recovered only after a concerted effort by conservationists in the early 20th century. The bison is also the state mammal in Kansas, Oklahoma and Wyoming.